I heard of this shrimp appetizer made out of wonton wrappers and shrimp that you dip in a jalapeno jelly. As is my custom, I “doctored” the recipe and am sharing it here with you! Slice shrimp in half length-wise. Dip wonton wrapper in milk. In the middle of the wonton wrapper, place shrimp diagonally. Add a sprinkle of green onions, cilantro, and a couple red bell pepper pieces. Top with a 1/2 tsp of cream cheese. Roll up from one corner and place seam side down in frying pan with about 1/2 inch of hot oil. Fry until light brown on each side. Serve with Raspberry-Jalapeno jelly for dipping. 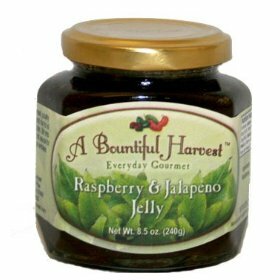 Alternately, you can make your own jelly by mixing raspberry or apricot preserves with hot jalapeno jelly; though this A Bountiful Harvest brand is delicious!